We’re so used to everything happening quickly or need to be finished as soon as possible. It’s easy to bring this way of thinking out with us in the field and we forget to take the time to experience and enjoy a location. Another advantage of using a telezoom is that you’re able to capture different perspectives than with a wide angle. Not only does this mean that you can photograph a subject without risking your life climbing down a cliff, it also means that you’re able to change your focus directly to the subject instead of just having it as a part of the image. This means that you can make a small element into the main part of your image. 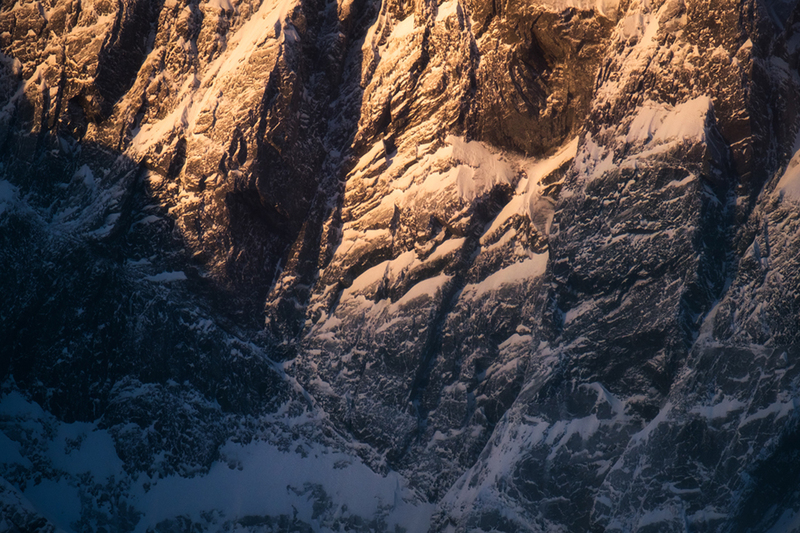 Such as the image below: the contrast between shadow and light was only visible on a small spot in the mountain and with a wide-angle, it wouldn’t have any impact. I was able to make this the main focus of the image by using my Fuji X-T2and Fujinon 100-400mm at 400mm. I also felt it told a better story than the grand vista.